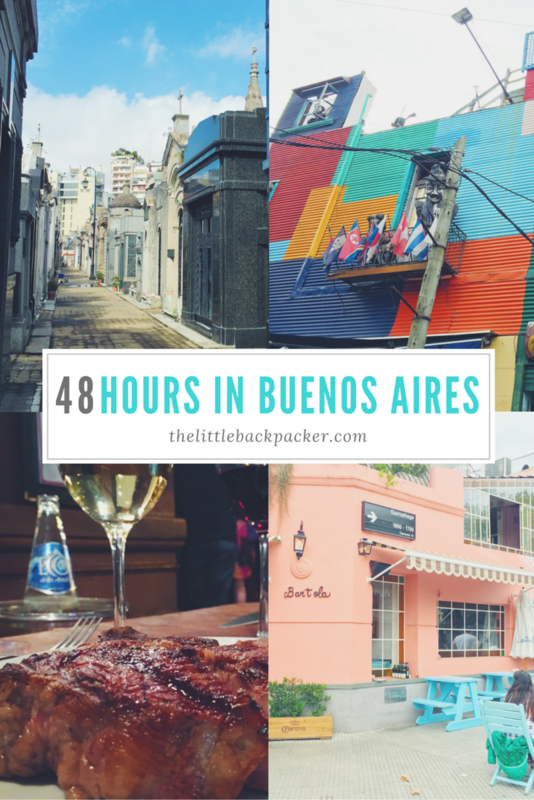 I recently visited Buenos Aires with JP and despite having only 48 hours in the city we managed to make the most of our time while relaxing too. Buenos Aires felt very similar to Santiago in Chile but very different to Rio de Janeiro – even the weather was a little chilly in late March. BA is also similar to the likes of Barcelona and Paris especially when it comes to the architecture. It was the perfect place to spend the Easter weekend. The day doesn’t tend to start that early in BA, so swap your early night for a lie in – they also aren’t big on breakfast so we took to having something in our apartment before heading out. This itinerary is based on our stay in the Recoleta district of the city, however, most of it is accessible no matter where you are staying. 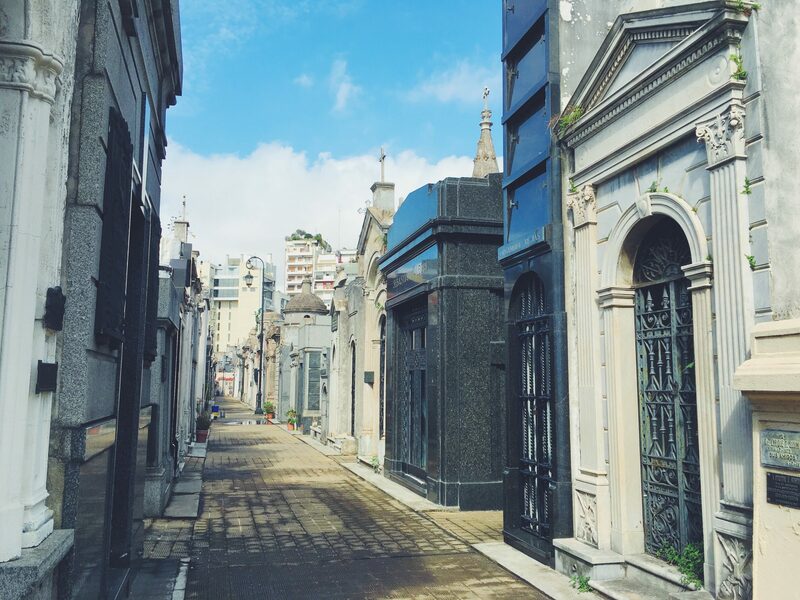 Spend the morning exploring Recoleta Cemetery in the north of the city. Make sure you spend time wandering away from the main route around the cemetery as there is something to see on every corner. If you time is right you could take the guided tour (11am for English). 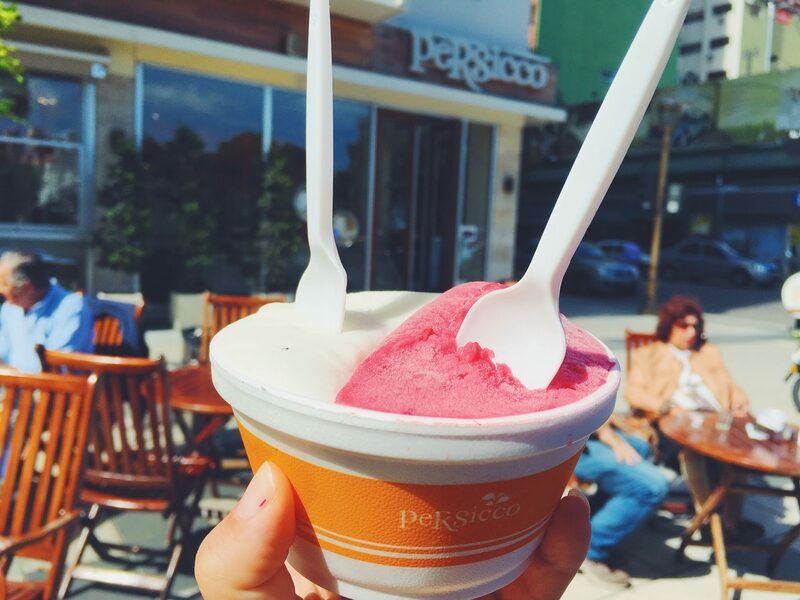 Not far from the cemetery is Persicco, the best ice cream cafe in town. Grab a coffee and 1/4 kilo of ice cream to eat on their outside patio (providing it’s a warm day, if not they have seats inside). Once you’ve refuelled it’s time to head on. Wander down to Santa Fe and find the most wonderful bookshop that ever did exist. El Ateneo used to be a theatre before being transformed into the store it is today. I could tell you to spend time exploring here but you won’t be able to stop yourself. 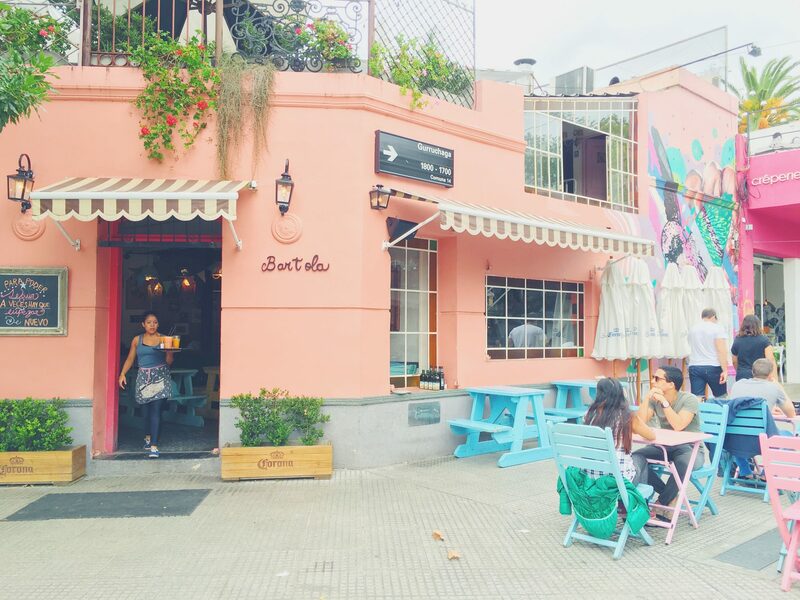 Wander back towards the district of Recoleta for lunch at Delicious Cafe. 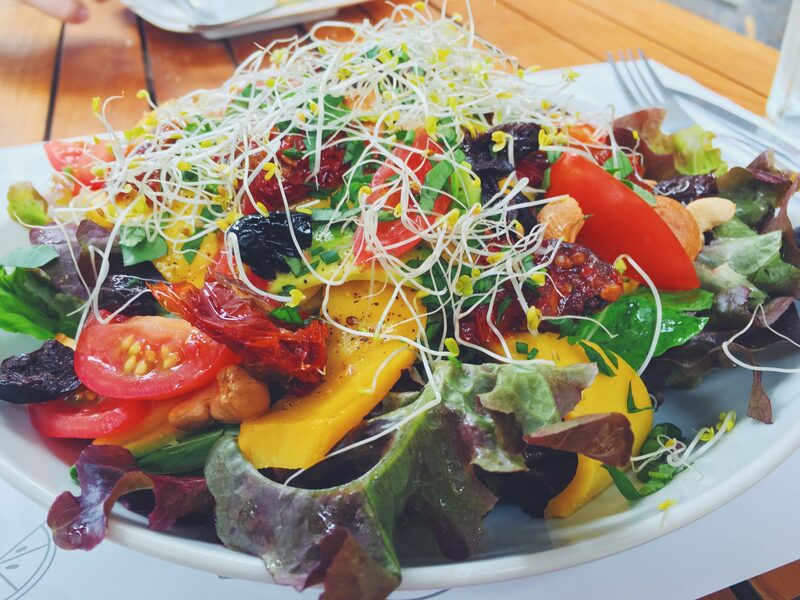 Their salads are amazing and they have a great range of sweet treats. Again nab one of the tables outside if you are visiting in good weather. Once lunch has been consumed slowly head towards the microcentro of the city to explore the Cathedral, Plaza de Mayo, Obelisco, 9th July Avenue and the main shopping mecca Calle Florida. This will take up most of your afternoon so once you have finished exploring head back to your accommodation to chill out and freshen up before dinner. Typically people in Buenos Aires don’t eat until late but trust me you need to be at this restaurant of choice for at least 7.30pm unless you cleverly make a reservation. Don Julio is located in the Palermo district and comes highly recommend despite the slightly touristy reputation it has. Pop your name on the waiting list and enjoy the free bubbles and nibbles they bring around while you wait. The queue was anything from 40 minutes to one and a half hours while we were there. We must have waited around 55 minutes but trust me, it was worth it. The most delicious steak I have ever eaten and beautiful red wine (according to the boyfriend, I cannot stand the stuff). If you wish to continue your night then be sure to know that most locals don’t start partying until 2am… we wanted to be fresh for the second day of sightseeing so headed home after dinner. Begin the day by heading out to the Palermo district again, explore the part names as ‘Palermo Hollywood‘ then head towards ‘Palermo Soho‘. Once here there is street art to admire and an abundance of cafes to test. My choice was Bartola with the pastel pink building and colourful chairs. Head here before 12.30 for the brunch menu or around 12.45 for the lunch menu. We ate from the brunch menu, however, the lunch menu also looked delicious. If you didn’t have time to explore the whole neighbour before eating then finish doing so. A trip to Plaza Serrano is definitely worthwhile, especially if you are visiting on the weekend as they have a market then. 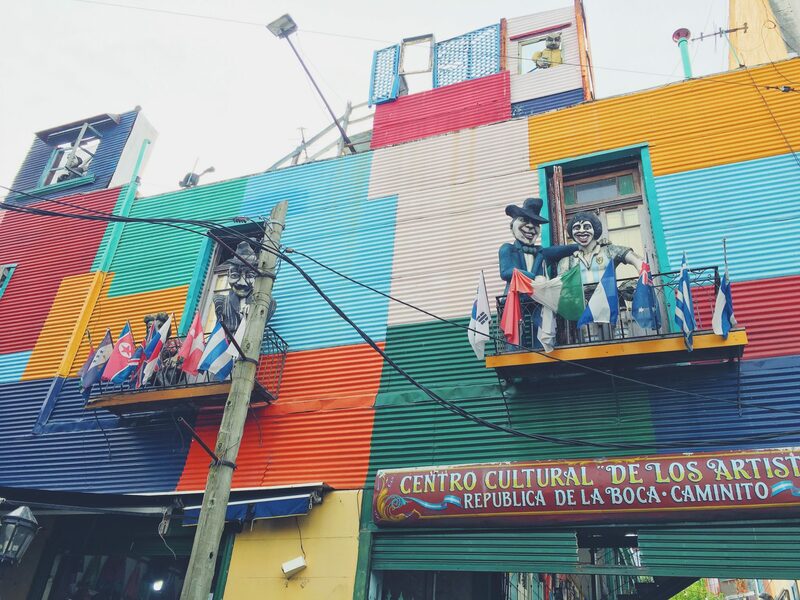 The next stop for the day is La Boca where you find the colourful and exciting street of El Caminito. You can take buses 29, 64 or 152 from Palermo to here. We actually used the Buenos Aires tourist bus while we were in the city but I would not rate their service especially for the price we paid. Wander around here and enjoy the colourful neighbourhood but don’t wander too far afield as it can get a little nervy apparently. The main hub is highly touristy so take this with a pinch of salt but expect to pay inflated prices if you stop for a drink or snack here. If you want to take day two a bit quicker then you could explore San Telmo, Puerto Madero or the gardens north of Palermo. 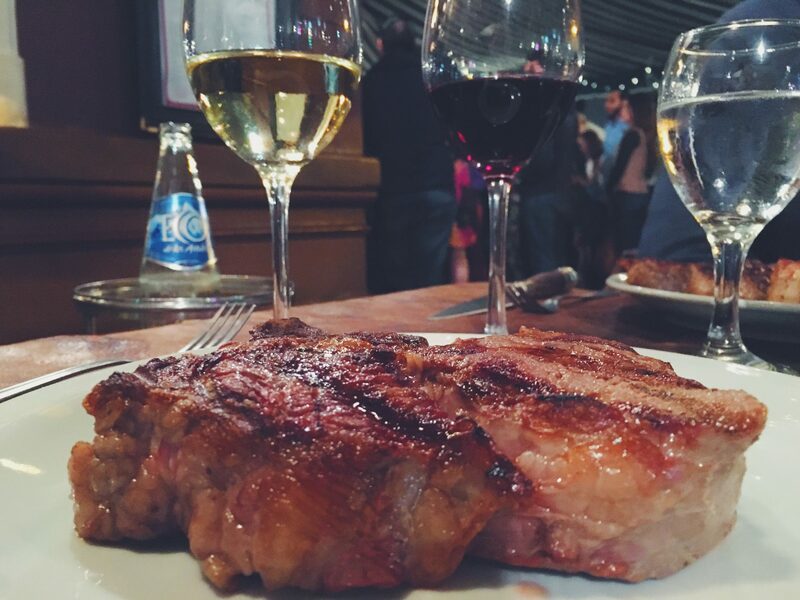 Finally for dinner tonight, head out a little later and back to the district of Recoleta to Rodi Bar a typical Argentine restaurant popular with locals and tourists alike. You may queue for a table here but it won’t be as long as the previous night. Again the order of the night is steak and red wine but they do have other options if you are not keen on the same thing twice. And that is how I would recommend spending 48 hours in Buenos Aires. This obviously isn’t everything you can do especially as tango is missing from this list but our focus was more on food than dancing so this itinerary suited us perfectly. Hopefully it will be helpful for the planning of your trip. Do you have any suggestions of what to add?